Yamatane Museum of Art, close to Shibuya and Ebisu, houses a large collection of modern Japanese paintings and ukiyo-e prints. This article includes the museum director's commentary on Japanese art and introduces a cafe with one-of-a-kind desserts. Can you picture a quiet gallery space where you can take your time looking at artwork, perhaps with a cafe where you can eat delicious Japanese desserts? If this sounds appealing to you, visit Yamatane Museum of Art, a facility offering its visitors a superb Japanese cultural experience, a short walk from Shibuya and Ebisu in the heart of Tokyo. Coming into view just before a street lined with Ginkgo trees, is a building with a quiet and refined atmosphere. Yamatane Museum of Art is a museum specializing in nihonga, or Japanese-style paintings. The museum has a total of about 1800 nihonga works in its collection, with a focus on modern and contemporary art pieces. The collection has works by Yokoyama Taikan and Okumura Togyu, two painters representative of the modern art movement, and also pieces of art by Toshusai Sharaku, Utagawa Hiroshige, and other well known ukiyo-e print designers. What exactly are nihonga-style paintings in the first place? The main characteristic of nihonga are the materials used in the paintings. Fundamentally, nihonga utilizes materials such as sumi ink, seashells, and iwa-enogu. These materials are used to paint on silk and also Japanese washi paper surfaces. Iwa-enogu is a paint material made from natural mineral pigments. Thanks to this natural paint (enogu), nihonga are highly delicate and refined, profound pieces of work. Today as a special feature, we present director Yamazaki-san’s commentary, which highlights two works currently on display at the Yamatane Museum of Art. Pay special attention to the colors of each painting for both pieces. This piece of art features raging flames and moths swarming around inside. One look at the mystical beauty of Dancing in the Flames (Enbu), and your breath will be taken away. From one glance visitors can see just how realistic the picture is. A traditional technique borrowed from butsuga (*1) is used for the flames. The butsuga-style of art is used as the basis for this work, and the faint and blurry contours painted on to make the flickering flames look all the more realistic. Hayami Gyoshu (1894-1935), broke new ground as a nihonga painter using various expressions, fulfilling an important role in the modern Japanese art world. This work was painted in 1925. In that the summer of the same year, Hayami stayed in Karuizawa in Nagano Prefecture, where he built a bonfire every night, gazing intently at the flames and observing the moths gathering around the light. *1 butsuga: a genre of artwork in which Buddhist narratives or Buddhist priests are painted. There’s no light in the mountains, and a deep darkness spreads out behind the burning flames. The flames in the painting are so lifelike that when Hayami’s family first saw it, they apparently screamed, “There’s a fire!” and panicked. This is a work we suggest everyone see in-person, and is planned to be on display starting from the spring of 2019. Looking as though one might get sucked into them, the swelling waves in this painting are depicted dynamically with a brilliant blue color. Kawabata Ryushi (1885-1966) is a painter known for his bold brushstrokes and colors, and large-scale works of art that overflow with energy. He originally belonged to an organization called Inten (Japan Art Institute), but a desire to create lively, inspiring, and appealing works of art led him to form a new art group. Maelstroms at Naruto was a piece of work that Hayami painted for the group’s first exhibition. 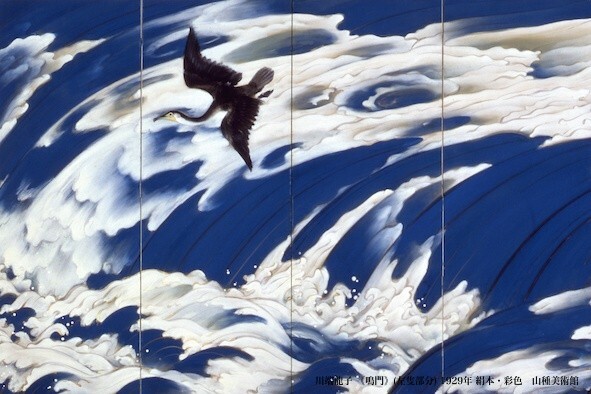 The painting's characteristic blue color uses an iwa-enogu called ultramarine. Costing tens of thousands of yen per one hundred grams, this is an extremely expensive painting material. "Maelstroms at Naruto" uses around 3.6 kilograms of it. To create the painting’s white, foaming waves, "gofun," a white pigment made from pulverized oyster shells, is used. “The vivid ultramarine color stands out prominently in the exhibition space, and the white color of the gofun, creates an extremely bold and brilliant contrast. This piece shows Ryushi’s enthusiasm and desire for wanting to create a new kind of nihonga,” comments director Yamazaki-san. The actual painting is more than eight meters in length. You definitely need to see the actual version of this masterpiece. This painting will be on display as part of an exhibition called, Depicting Water -Hiroshige's Rain, Gyokudo's Brooks, and Togyu's Maelstroms from July 14th to September 6th, 2018. At Yamatane Museum of Art, there are no permanent exhibition spaces. Instead, special exhibits are held five or six times a year. For example, the museum will put on exhibits allowing its guests to feel Japan's four seasons, such as sakura cherry blossom-themed displays, events focusing on fashion, and humorous Kawaii (Japanese for cute) exhibits collections of paintings of adorable people and animals. Each exhibit showcases nihonga from a different approach. On display at the time of this interview was a collection of works from a school of painting called Rimpa. This special exhibition was called "The Rimpa School from Tawaraya Sotatsu to Tanaka Ikko," and ran until July 8th, 2018. If you look closely at the pieces of art, you’ll understand the ingenuity of the multi-layered paint application, or how the colors are gently filled in by delicate brushstrokes. It’s almost as if you can even hear the breathing of the painters who created these artworks. Close attention was also paid to creating an atmosphere ideal for viewing paintings. Lighting is set up individually, so that each piece of art is illuminated in a way that ensures it will be observed under the most gentle and beautiful conditions. We were also told that the museum selected flooring in order to minimize the sound of shoe heels and other distracting noises. In addition, the main works are accompanied by a written English commentary. English pamphlets are also distributed at the reception desk, allowing English-speakers to supplement their experience and heighten their interest in the art. After looking through the exhibit, be sure to stop in at the museum shop. Here they have exclusive exhibit goods as well as Yamatane Museum of Art original merchandise. Also lining the shop shelves are cute but practical items chosen by the museum director and staff, such as accessory pouches, tenugui, and other similar items. *Shop items change according to the current museum exhibit. Traditional Japanese Sweets Modeled After Art Pieces! You can’t afford to miss visiting Cafe Tsubaki, located right by the entrance. Here they offer a wagashi (traditional Japanese sweets) and matcha green tea set (1100 yen with tax). New wagashi are specially made for each exhibit, and are exclusive treats that can only be enjoyed here! For every exhibit, the museum and a wagashi shop join forces to develop a new dessert that’s tailored to one of the artworks on display. This time, the dessert that I was lucky enough to receive was the Midorinokage, modeled after the painting Emerald Mosses and Verdant Turf (see above picture). The rabbit, hydrangea flowers, and the green lawn depicted in Hayami’s painting have been transformed into wagashi sweets. And just like in the painting, they are charming and adorable in appearance. After taking just one bite, the natural sweetness of the anko (red bean paste) and the apricot’s refreshing acidity slowly spread throughout my mouth (Midorinokage was available until July 8th, 2018)! Yamatane Museum of Art, filled with ingenuity and creativity, is a space where visitors can encounter the charms of Japanese nihonga from different perspectives. We hope you take the chance to take a look yourself at authentic nihonga and experience this deep and profound world. Business Time 10:00-17:00 (entry up until 30 minutes before museum closing time). *For special exhibits opening times can sometime change. Fixed holidays Mondays (When Monday is a national holiday the museum is open, and the next day it's closed), Dec. 29-Jan. 2, and closed for exhibition installations. Accepted Credit Cards Cards accepted on purchases exceeding 3,000 yen in the Museum Shop. Menu/Pamphlets in Other Languages English pamphlets available. Nearest station Ebisu Station, Shibuya Station. Access 10 minutes on foot from the west exit of JR Ebisu Station or from exit #2 of Tokyo Metro Ebisu Station. Also, 20 minutes on foot from the south exit of JR Shibuya Station and Tokyo Metro Shibuya Station. Price For regular exhibitions: Adults-1,000 yen, University students / high school students-800 yen, Junior high school students and younger-free of charge (*prices can vary with the exhibition). Telephone number 03-5777-8600 (English available).